Seven Reasons Why to Choose Perma-Cote! Posted October 17th, 2013 by Stephanie Ellis. Seven reasons why you should trust the proven value of Perma-Cote PVC-coated galvanized rigid conduit. Click any image for a larger view. Perma-Cote ensures premium corrosion protection without a premium price. You deserve the corrosion protection you pay for. ETL PVC-001 Verified Perma-Cote has been independently proven to provide ten or more times the protective product service life when compared to other brands — and at no added cost. Ten times the proven protection against huge risks from premature product or system failures caused by sub par conduit quality– AT NO ADDED COST. Download the complete “Seven Reasons” why there is “No Equal” to Perma-Cote. Not all manufacturers have achieved a consistent level of reliable bonding. Perma-Cote has. Need proof? Seeing is believing. Perma-Cote works because its coating adheres. Not all brands can make that claim. When the PVC coating on galvanized rigid conduit adheres — the product will successfully protect the steel substrate from corrosion damage. When the PVC coating doesn’t adhere properly the product will fail. It’s as simple as that. All coatings are permeable, those that have a strong adhesive bond will not allow the substrate to be exposed to the environmental elements. 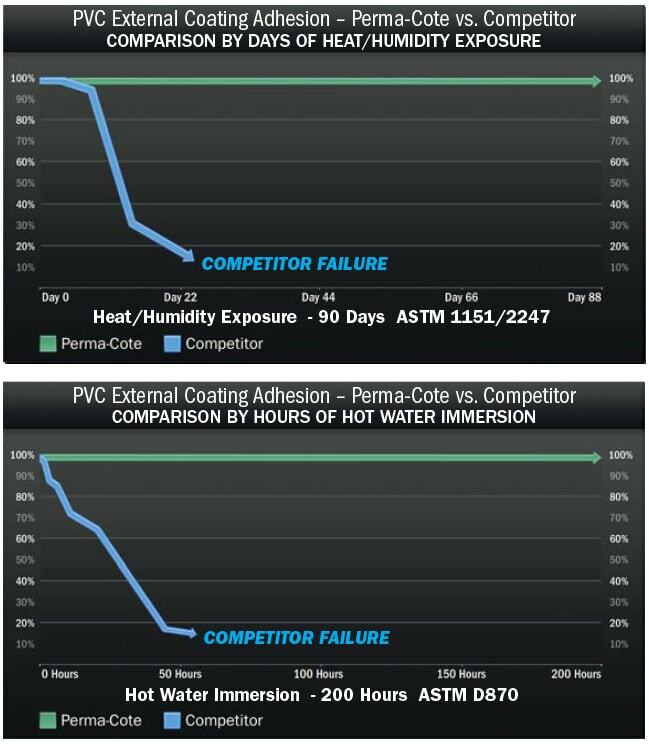 This graphic illustrates the tendency of the competitive coating to lose adhesion. The result is that moisture penetrates, creates voids or pockets, and puts the metal substrate in direct contact with corrosive elements. 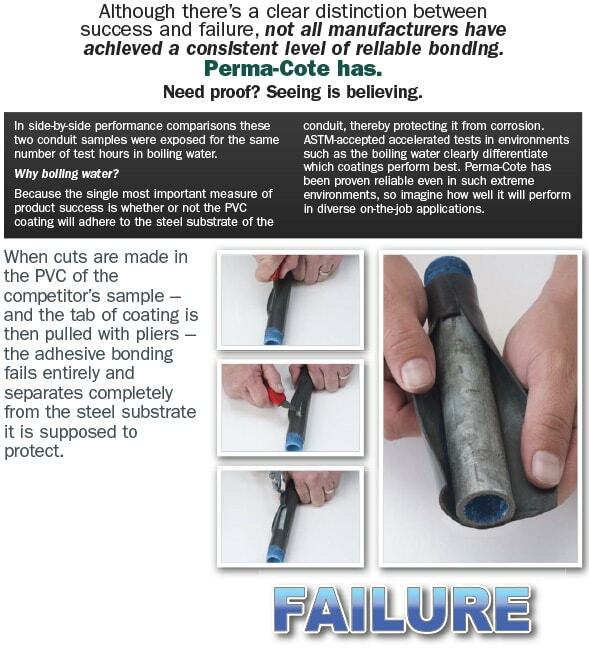 Seeing is believing…Perma-Cote competitors “Pull Test” adhesion failure. This pocket actually accelerates corrosion because it traps the contaminates between the coating and substrate. The life span of coated conduit becomes limited and failure is only a matter of time. Don’t allow this to happen to your conduit. In side-by-side performance comparisons these two conduit samples were exposed for the same number of test hours in boiling water. Why boiling water? 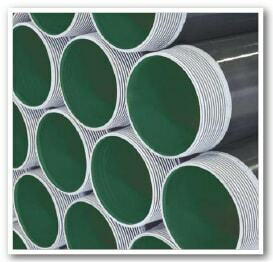 Because the single most important measure of product success is whether or not the PVC coating will adhere to the steel substrate of the conduit, thereby protecting it from corrosion. ASTM-accepted accelerated tests in environments such as the boiling water clearly differentiate which coatings perform best. Perma-Cote has been proven reliable even in such extreme environments, so imagine how well it will perform in diverse on-the-job applications. Perma-Cote is both UL6 listed and ETL PVC-001 Verified. Others are not. All major brands of PVC-coated galvanized rigid conduit meet exactly the same standards established in UL, and are authorized to carry an identical UL listing label for PVC- coated galvanized rigid conduit. However — not all brands are ETL PVC-001-Verified. Perma-Cote is. Others are not. Why is this of critical importance? UL6 is an important standard that addresses safety for rigid metal conduit. It is not, however, a performance standard. ETL PVC-001 Verified is an internationally recognized listing based on performance evaluations and on predicting service life. It is on the basis of independent, objective product comparisons by ETL that Perma-Cote has been proven to provide ten or more times the protective service life of brands that are not authorized to carry the ETL PVC-001 label. Risk of premature PVC-coated galvanized rigid conduit failure. 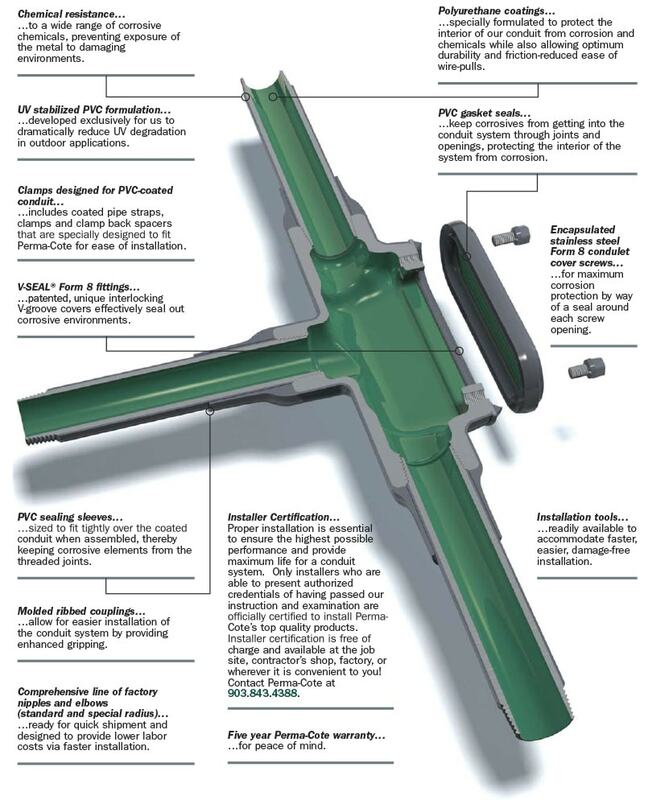 Specifying ETL PVC-001 Verified Perma-Cote protects you, and those to whom you are responsible, from the enormous risk of premature PVC-coated galvanized rigid conduit failure. To review the vital reasons why: All major PVC-coated conduit brands comply with standards as established by UL6. There exists only one definitive difference between brands of PVC-coated galvanized rigid conduit: ETL PVC-001 Verification of product performance and predictability of service life. Therefore, if predictability of product service life is important to engineering design, avoidance of costly or catastrophic product or system failure, it should be assumed in the specification process, that only PVC-coated galvanized conduit carrying the ETL verification label will meet the standards established by all relevant ASTM tests, including those predicting product service life. The risk of premature product failure can have an enormous impact on costs including downtime, safety, legal and environmental. That fact needs to be addressed in job specifications by written mandates requiring ETL PVC-001 Verification. ProTECH™ system provides our conduit threads with unsurpassed corrosion protection. Unsurpassed manufacturing explains why Perma-Cote has No Equal. Not all PVC-coated galvanized rigid conduit is created equal. 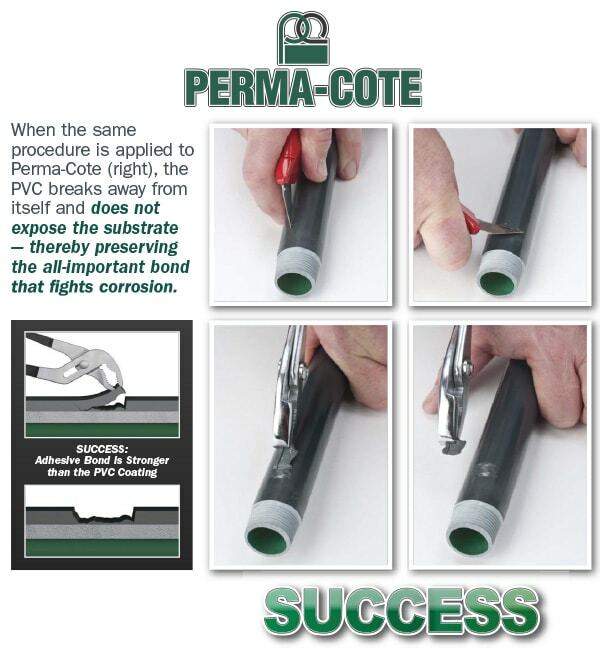 As the original pioneer of this product, Perma-Cote has maintained and evolved its position of technological leadership in many key ways: Unmatched bonding adhesion for unmatched conduit protection. As one of the original authors of NEMA RN-1 our company thoroughly understands and conforms to the voluntary, non-regulated guidelines of this standard. This is especially true with regard to how we prepare the zinc surface of conduit to enable a degree of coating adhesion not achieved by other manufacturer. Threads are hot-galvanized using specially designed equipment, including 3-axis robotic arms. In accomplishing this we remove surface oxidation and, through a special technology called AEP (Adhesion Enhancement Process), we rough the outer surface of the zinc without harming or eroding it. In that way, not only do we comply with NEMA RN-1, but we exceed it. Our hot dipped galvanized conduit and fittings outperform the competition because we have prepared the surface of our products for maximum bonding reliability. Nothing can touch our threads! 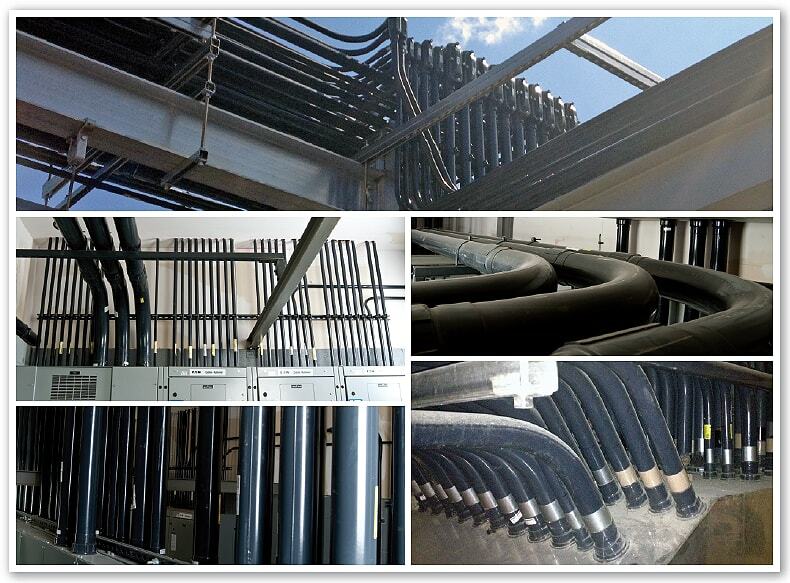 Our multimillion dollar ProTECH™ system provides our conduit threads with unsurpassed corrosion protection. After PVC coating of the conduit, the automated process begins with a trimming operation to remove excess PVC from the conduit ends. Next is mechanical surface preparation of the previously chemically cleaned conduit threads. This is critical because surface preparation is the key to any good bond. Then, the clean pipe threads are hot-galvanized using specially designed equipment, including 3-axis robotic arms. Through the final manufacturing process nothing touches the zinc coating of our threads! Perma-Cote provides you value added differentiators. Our V-Seal® gasket — with special interlocking “V” groove —- is the most effective way of preventing corrosion damage by sealing PVC-coated Form 8 Conduit Bodies, sizes 1/2″ to 2″. You won’t have to pay more for the best available protection than you would for a standard fitting. It’s all part of the unequaled value! …to a wide range of corrosive chemicals, preventing exposure of the metal to damaging environments. Perma-Cote provides you value-added differentiators. …developed exclusively for us to dramatically reduce UV degradation in outdoor applications. …ready for quick shipment and designed to provide lower labor costs via faster installation. …includes coated pipe straps, clamps and clamp back spacers that are specially designed to fit Perma-Cote for ease of installation. …patented, unique interlocking V-groove covers effectively seal out corrosive environments. 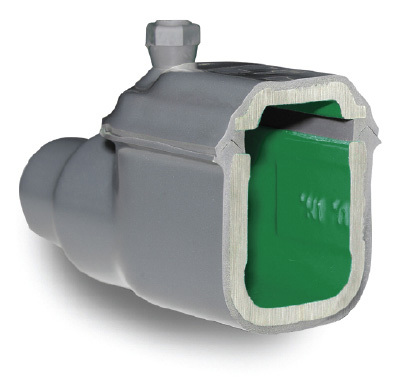 …allow for easier installation of the conduit system by providing enhanced gripping. …sized to fit tightly over the coated conduit when assembled, thereby keeping corrosive elements from the threaded joints. …readily available to accommodate faster, easier, damage-free installation. Proper installation is essential to ensure the highest possible performance and provide maximum life for a conduit system. Only installers who are able to present authorized credentials of having passed our instruction and examination are officially certified to install Perma-Cote’s top quality products. Installer certification is free of charge and available at the job site, contractor’s shop, factory, or wherever it is convenient to you! Contact Perma-Cote at 903.843.4388. Just look for the combined ETL PVC-001 and UL Label and you’ll know you’re protected! Use Perma-Cote and you will benefit from objective, independently-proven anti-corrosion performance. Just look for the combined ETL PVC-001 and UL label and you’ll know you’re protected! There are myths about PVC-coated galvanized rigid conduit. There are truths about PVC-coated galvanized rigid conduit. Here’s how you can separate fact from fiction. 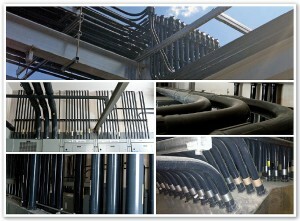 All PVC-coated galvanized rigid conduit is the same. As long as it’s UL-listed that’s all that matters. All PVC-coated galvanized rigid conduit is NOT created equal. All major brands of PVC-coated galvanized rigid conduit do in fact carry the UL6 listing. That’s great. It’s important to know, however, that this is a safety-related listing. It is NOT a performance or service life listing. In fact, UL6 does not differentiate between the performance of coatings. It considers zinc and PVC as equal alternatives and does not suggest the appropriateness of a specific coating for a specific environment. The truth is: Perma-Cote also carries the ETL PVC-001 verification label demonstrating that in performance, the reliable, protective service life of Perma-Cote is at least ten times longer than other brands. ETL is a regulated standard that is re-tested every quarter to verify performance. Ongoing compliance assures a consistent quality in the manufacturing of our product. 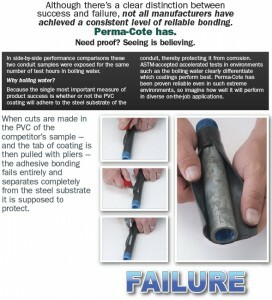 ETL testing evaluates the performance of PVC-coated galvanized rigid conduit in boiling water. That isn’t relevant because no one boils conduit in real applications. The testing methods chosen by ETL are nationally recognized ASTM accelerated life cycle test methods to evaluate the effectiveness of a coating under the two most common environmental conditions of heat and humidity. These are not application tests. They are accelerated tests to compare two or more products in the same environment at the same time. In hot water immersion other brands’ coating began to fail within the first hour and completely after 50. Perma-Cote’s coating maintained its integrity for 200 hours. In the humidity test, the other coatings began delaminating after 9 days. Perma-Cote’s coating showed no adhesion loss even after 90 days. The superior PVC coating is clear. Perma-Cote paid for ETL testing so the results are marketing hype. The first part is true. Perma-Cote paid for ETL testing. Just like every manufacturer pays for product testing or UL testing and listings. ETL is one of the foremost recognized testing and evaluation services in the world. Its results and verifications are internationally accepted as objective standards for diverse industries. Even our competitor accepts the importance of ETL because many of the other products manufactured by its parent company carry the ETL label. Our competition is welcome at any time to submit their PVC-coated galvanized rigid conduit for similar evaluation. ETL PVC-001 is an open standard. We have to assume that the only reason others do not have an ETL label is because their product does not meet the minimum thresholds for service life requirements. Not all PVC-coated galvanized rigid conduit is created equal. If product performance and service life are important to you… look for the ETL PVC-001 Verification label. If your PVC-coated galvanized rigid conduit doesn’t carry an ETL PVC-001 label you risk premature product failure and the consequences of costs related to downtime as well as safety, legal and environmental issues.